Rosemary (Rosemarinus officinalus) is an herb in the mint family. It has needles that look like the stubby needles you see on some pine trees, like a Fraser Fir. It is native to the Mediterranean region and grows commonly near the sea. In fact, it’s Latin name means “dew of the sea.” The leaves have a strong and distinctive smell, piney and sharp. Though rosemary is at home in warm, dry climates, it is a hearty plant, considered easy to grow. It would be quite unusual to find rosemary growing wild in Pennsylvania, but it is possible. 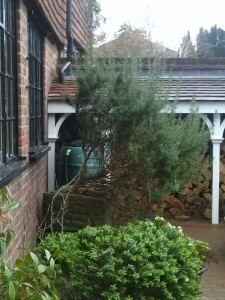 Here is a photo I took of a thriving rosemary plant at my friend’s house in West Sussex, England, not at all a warm or dry place. 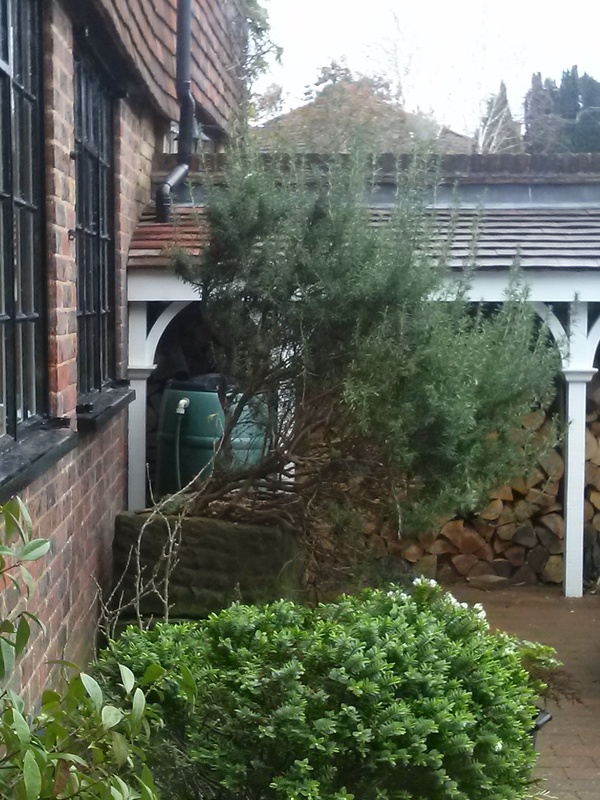 The rosemary is the taller plant in the middle of the picture. When I imagine rosemary growing on the island in The Rosemary Spell, it looks like this in my mind. Rosemary has long been associated with memory. Shakespeare’s Ophelia says rosemary is for remembrance, and scientists in 2013 showed that the rosemary scent does indeed prompt memory. 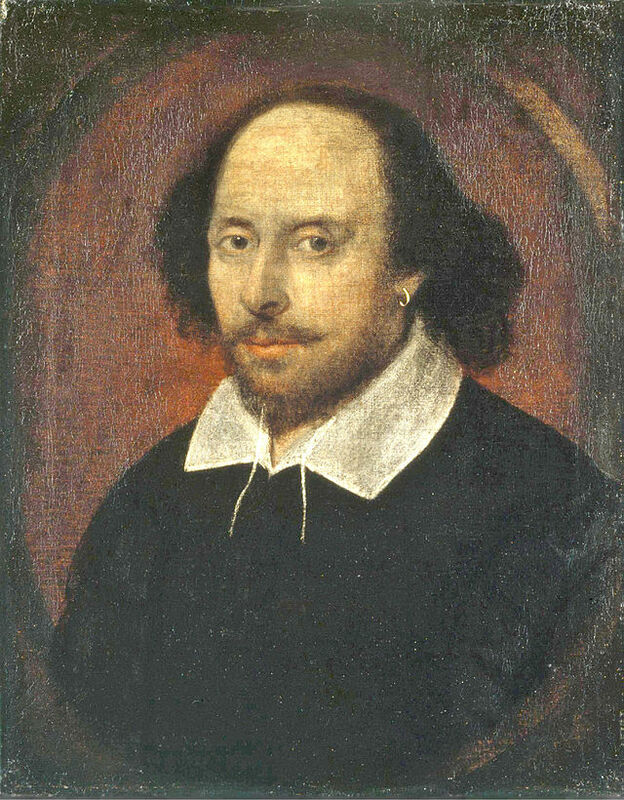 William Shakespeare (“the Bard”) lived from 1564-1616. He was a poet, playwright, and actor and is considered by many to be the most important writer in the English language. He wrote more than 30 plays and many poems, including the Sonnets, which contain 154 poems. If you are interested in a biography of Shakespeare, I recommend this one provided by the Folger Shakespeare Library. The picture included here is the one Rosemary and Adam look at online. The site Rosemary uses to search the plays is called Open Source Shakespeare. Pick a favorite word or phrase and see how many times Shakespeare used it. The Susquehanna River starts in New York and runs through Pennsylvania and Maryland into the Chesapeake Bay. 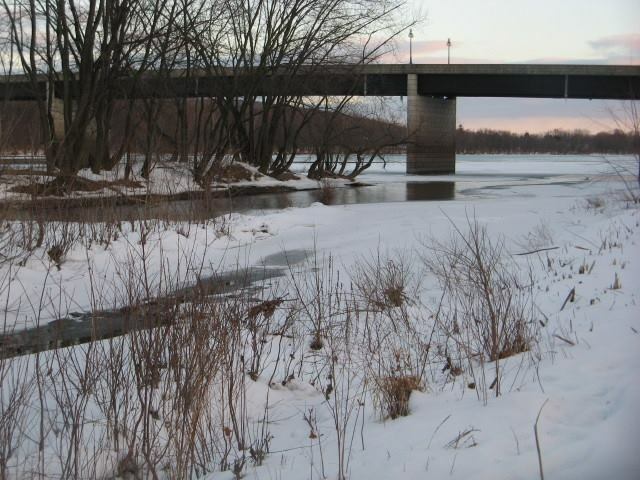 It splits into two branches, and Lewisburg, the model for the fictional town of Cookfield, is on the West Branch. 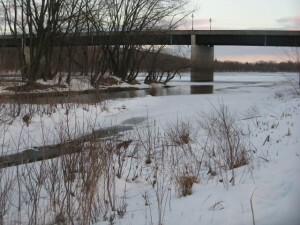 At Lewisburg, the river is wide and usually shallow. But it is a wild thing with strange currents, and when it floods, it gets deep and fast and mean. The northeast corner of Spain is called Catalonia. 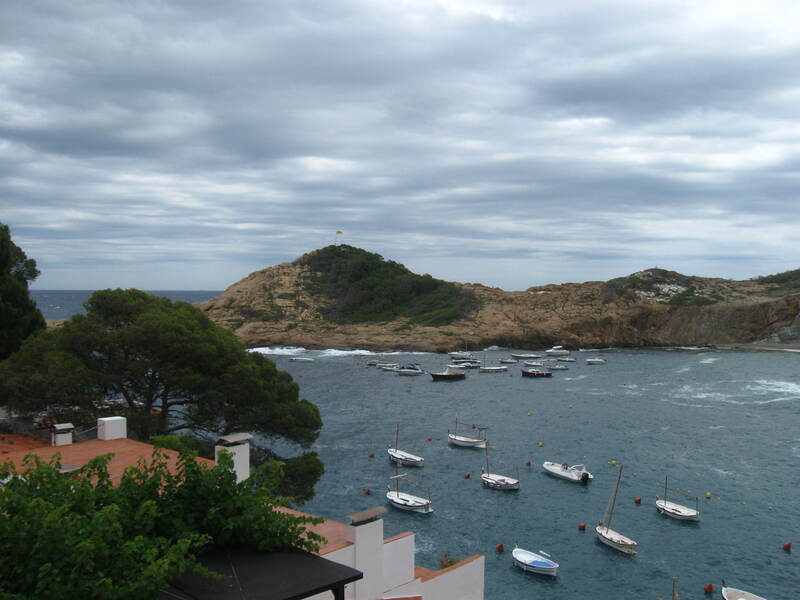 The region includes all types of beautiful landscapes, from the Mediterranean coast through the lush farmlands of the Empordá to the snow-capped Pyrenees. 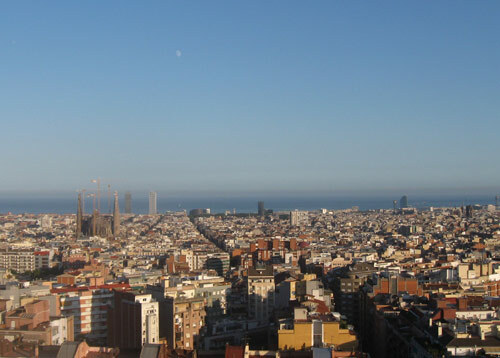 The main city is Barcelona. Catalonia is what’s called an autonomous region, which means it governs itself almost as if it were a separate country. For example, public schools and health care in Catalonia are controlled by the Catalonian government, not by the Spanish government, and many Catalonians identify themselves first as Catalonian and second as Spanish. Like some other autonomous regions in Spain, Catalonia has its own culture and language (Catalan). Catalonia has a rich history. Settled long ago by Greeks and then Romans, it was also home to Iberians, Visigoths, Moors and Franks before it came into its own as a country in the twelfth century. From that period up to the present, Catalonia has produced its own literature, art and architecture. 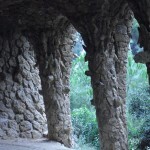 For example, Antoni Gaudí (1852-1926) is one of Catalonia’s most important and famous architects. He designed a cathedral, La Sagrada Familia (the Holy Family), construction of which began in 1882 and continues to this day, and the beautiful Parc Güell (Güell Park), both of which are part of a UNESCO world heritage site that includes all of Gaudí’s work. The cathedral looks like it is made from dripping sand, and the hillside park is full of playful touches like serpentine walls and benches and mosaic designs. After the Spanish Civil War ended, in 1939, Spain was controlled by Francisco Franco, a dictator who demanded that all the autonomous regions give up their independence. People in Catalonia were not allowed to speak Catalan in school, and Catalan could not be used on signs or in official documents. After Franco died, in 1975, Catalonia became an autonomous region again. In A Sketch in Time, Micah and his family have come to spend a year in Barcelona. 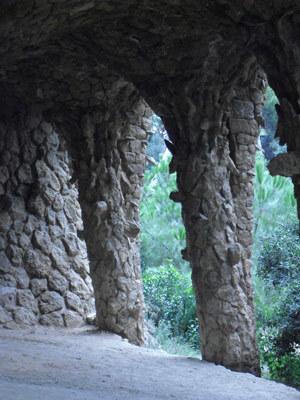 They live near the Parc Güell in a part of the city called Gràcia. They also visit a family farm near a village called Sils, though they never go to the village. Sils is not far from the city of Girona. They visit another village late in the book, but this place is fictional. If you are interested in learning more about the history of Catalonia, you can look at the web site of the wonderful Museu d’Història de Catalunya (http://www.en.mhcat.cat/). It’s even in English! The Civil War lasted from July 1936 until April 1939. It began when a group of army generals who called themselves the Nationalists decided to overthrow the Republic, Spain’s democratically elected government. The Nationalists, eventually led by General Francisco Franco and supported by many in the military, quickly gained control of much of the country, but Madrid, Barcelona, and a few other communities resisted. Barcelona fell in January 1939, and Madrid, the last holdout of the Republic, surrendered in March 1939. The alliances during the Civil War were very complicated, and it is difficult to say what sort of people were on which side. Even the military itself was divided, with some units providing support to the Republic. It was very different from the American Civil War, in which the two sides were defined mostly by geography. Like any civil war, the Spanish Civil War divided neighbors and families, and even now, almost seventy-five years after the war, the subject is a painful one. Catalonia resisted the Nationalists until the end of the war and is strongly associated with the Republic. Many famous writers, like George Orwell and Ernest Hemingway, fought with the Republic in what were known as the International Brigades, and their accounts of the struggle between democracy and dictatorship are some of the best known works of literature in English on Catalonia and the Spanish Civil War. During the war, many children lived in towns and cities that were bombed, and many were separated from their families. Like lots of children from Barcelona, Blanca and Xavi spend the war in the comparative safety of the countryside, and their experience is mostly one of struggling to find food and other necessities. They are lucky to escape the worst of the war. 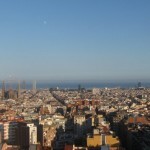 About seven-and-a-half million people live in Catalonia, and most of them speak Catalan. People often think that Catalan is a dialect of Spanish, since it is mostly spoken in Spain, but Catalan is a separate language. It is in the family of Romance languages, along with Spanish, French and Italian. In public schools, children in Catalonia are educated in Catalan and learn Spanish as a second language. They also start learning English when they are very young, and some also learn French, too. Many children know four languages by the time they finish sixth grade! Catalan is a beautiful language. In A Sketch in Time, Micah says that Catalan has a burbling sound, like a person speaking with a flat pebble in his mouth. You can hear some Catalan phrases and learn more about the language from this BBC website about European languages: http://www.bbc.co.uk/languages/european_languages/languages/Catalonian.shtml. If you just want to hear some spoken Catalan, you can listen to Catalunya Radio online: http://www.catradio.cat/endirecte/. If you listen for a while, you are likely to hear some songs you recognize, but they will probably be translated into Catalan. The food in Catalonia – especially Barcelona — has many subtle tastes, and making a meal, or even a dish, can be amazingly complicated, like a really delicious science experiment. Sometimes, however, especially in the countryside, food can be rustic and simple, with fresh ingredients perfectly prepared. One of my favorite meals is botifarra amb mongetes, a peppery sausage cooked on a grill with white beans and garlic. An example of innovative cooking I once enjoyed is a dessert of citrus foam served over white chocolate crumbles and pop rocks. Yes, pop rocks. If you would like to try a simple dish that Catalonians eat practically every day, here is a recipe for pa amb tomaquet, bread with tomato. Catalonians may eat this for breakfast, lunch or dinner. Sometimes it’s a side dish. Sometimes it’s the main course. It’s always delicious. You need any kind of firm or crusty (even a little stale) bread, a slightly soft tomato, olive oil, and salt. Slice the tomato in half with a horizontal cut so that the stem is in the center of one of the halves. Place the bread with the soft side up, and rub the tomato onto it, squeezing juice and some pulp all over the surface of the bread. You can make several pieces of pa amb tomaquet with one tomato. If you don’t use all the juice from the tomato this time, just put it cut-side-down on a small plate and stick it in your refrigerator to use later. Now, your fridge is officially Catalonian! 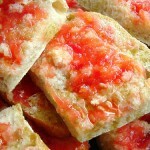 After the bread is coated with the juice and pulp from the tomato, drizzle a little olive oil over the bread. How much oil you use is entirely a matter of taste. I sometimes measure the oil by writing letters. For example, Micah might drizzle an “M” on his bread, and this would be just the right amount for him. After the oil comes the salt. Again, the amount is a matter of individual taste. I use the amount I can pinch between my thumb and forefinger. Sprinkle the salt over the bread, and you’re done. The quantities of each ingredient vary, as does the type of bread and the quality of the oil and the tomato, but the order is important: bread then tomato then oil then salt. Always. Once your pa amb tomaquet is ready, you can use it for a cheese or ham sandwich or have it alongside pretty much any other dish at all, but for your first time, I recommend just eating it plain. 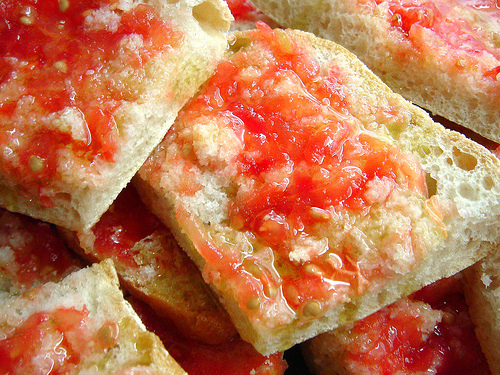 Those flavors together—tomato, oil, salt and bread—are the taste of Catalonia.